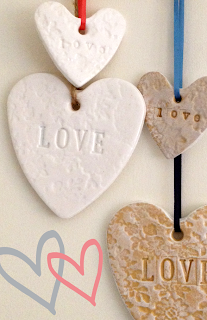 These hearts, made from Polymer Clay, are fairly simple and easy to make. There are so many options for this type of clay and I will put a few more items on here soon that I have made from the material. You need to shop around for the clay but I got mine from eBay. I also brought a lace effect plastic sheet to emboss the clay and create a more interesting final look. I experimented with two colours of clay, including white and a skin tone colour, which I added some paint to afterwards to create a more texture appearance. - Letters to emboss the clay if you wish to add words to the hearts. - Ribbon (if you want to hang them). 1. Preheat the oven according to the directions on clay. 2. Unwrap the clay and warm in your hands before rolling it to your desired thickness. 3. If you are using a texture plate then add this to one side and roll over with the rolling pin or press with your hands to ensure the pattern is taking to the clay. 4. Gently remove the texture plate and lay clay down on chopping board or hard, smooth surface. 5. 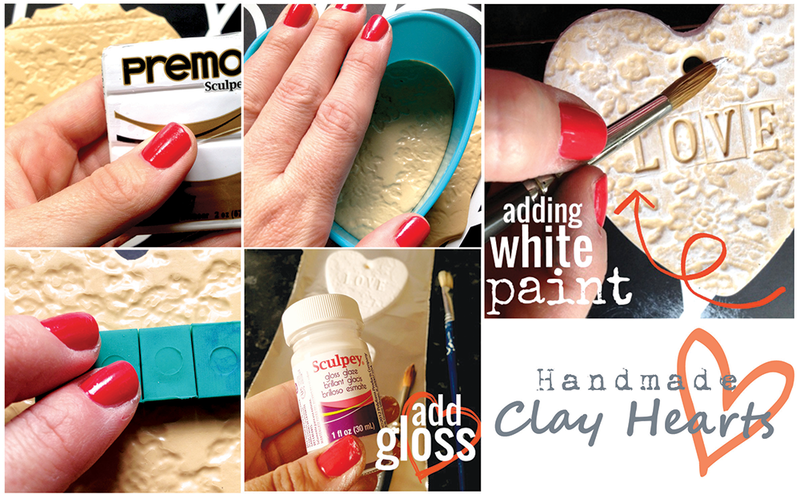 Use your cutters to press out your shape and gently and carefully remove excess clay from edges. You can neaten the shape with a palette knife if you need to by pushing in the edges. If you are wanting to hang the hearts you will need to create a hole in the top. I did this using the end of a paint brush. 5. If you are embossing with letters then this is the time to do this. Because of the pressure you apply to the heart when adding your letters be aware that the heart can slightly stick to your surface so be careful to take your time to remove it. 6. Place on the baking tray and oven as described on packaging. 7. Once thoroughly cool you can add your gloss varnish (2-3 thin coats), or add any paint you may want to. On my skin-coloured clay I used a wirey paintbrush to dry-brush white acrylic paint onto the surface being careful to allow some of the original clay colour to show through and add texture. The trick to getting this right is to use a little paint at a time, this gives you more control. After paint has dried you can then apply your gloss if needed. These hearts can be made in all sizes. I think smaller ones would make lovely Christmas tree decorations. Maybe you could emboss words like 'angel' or 'noel' on them and hang them on Christmas coloured ribbon! The larger ones look great hanging from door handles or on hooks on the wall, especially several together! And, of course, you could make some personalised ones for the special someone in your life or make rectangular ones for a child's bedroom! Let your creativity go wild! My current top 5 hair products! New Video: August Collective Haul Pt 2: Beauty! Homemade Turkey Burgers - Super quick and easy!